This is the second post on the movie Prometheus. The first one explored why we shouldn’t rule out this movie based on its seemingly anti-Christian themes. This post will explore the movie itself, and hopefully show that this movie is not as unchristian as we might have preemptively assumed. But even so, the movie is very much about religion and science, a debate most Christians and scientists (and Christian scientists) are not over. Scientists, in this movie, are motivated to learn more about human origins. They find evidence and are on a mission to learn more. But what we see in this movie by the main character is not a mission to disprove faith. It’s simply a mission to find truth. Noomi Rapace’s character is actually deeply religious, clinging to her cross necklace despite her scientific discoveries. And this is the point that is interesting, to me, theologically. I personally believe that science and faith can coexist happily and inform each other. I believe that science and faith, or even science and scripture, are out to answer different kinds of questions. Science asks questions like, “how does x happen”, or “what is the origin of x in light of the evidence”? Faith asks, and scripture tries to answer, different questions like “who are we?”, and “why are we here?” Science fails when it tries to answer existential questions, and, conversely, faith and scripture fails when it is used incorrectly to try to answer scientific questions. Genesis does not begin: “here is a scientific account of the actual way in which the universe came into existence”. Rather, Genesis begins with the theological affirmation that “in the beginning, God created the heavens and the earth”, am assertion that the earth and its inhabitants we’re created intentionally, with purpose, and infused with meaning. And the conclusion of the film is especially telling. Rapace’s character has an opportunity to return home after alien attacks, having an alien squid baby ripped from her abdomen, and losing everyone she’s ever loved. Instead, she asks to go to the planet that the creators came from. Unsatisfied with her quest for meaning, she neglects her home and her health to pursue it further. This movie can be an interesting parable for our search for meaning. The Prometheus traversed the universe for four years, when some of us would argue that the answer was around her neck the whole time. (Though Ridley’s suggestion that Jesus was one of the “inventors” subverts that meaning.) Science can tell us wonderful things about where we came from, what we’re made of, and in the process cure diseases and offer hope or a better future. And all of that is great. But there will never, CAN never, be a scientific discovery that answers the existential questions of “why?” And at some point, we all end up asking that question, and we all answer it in different ways. 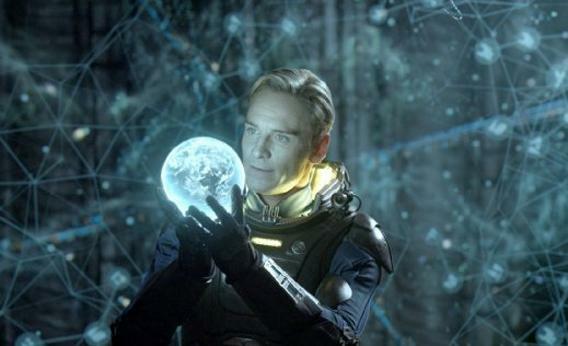 Prometheus is a movie about, ultimately, that question, and failing to answer it. Please, God, don’t let there be a sequel.